June 5, 2018 (Los Angeles, CA)—Only a groundswell of grass-roots peace marches and civil protests can stop the current White House Administration’s onslaught against social justice in the United States. 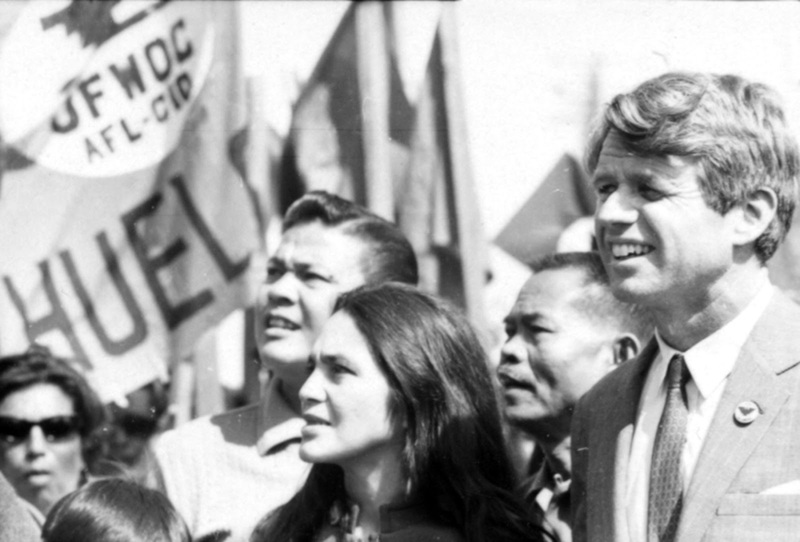 At this pivotal juncture in history, it’s up to us to turn our country into the compassionate nation Robert F. Kennedy imagined before his untimely and tragic death. He summed up his vision of social justice in his last speech, delivered fifty years ago during his visit to Los Angeles on June 5, 1968. After meeting with labor leaders César Chavez and Dolores Huerta—co-founders of the United Farm Workers union—as well as other prominent Mexican-American civil rights activists and political organizers here, Bobby invited Chavez to join him on the dais at the Ambassador Hotel as he uttered his last words of hope. “No wrong can ever be righted by riots and civil disorders,” he cautioned. “Surely, we can learn, at least, to look at those around us as fellow men and surely we can begin to work a little harder to bind up the wounds among us and to become in our hearts brothers and countrymen once again.” He could easily have been addressing the prevalent ills—such as gun violence in schools, use of excessive force against African Americans by police, the epidemic of homelessness facing our country today and the increasing absence of civility in political discourse. As a people, we have the power and the moral duty to become responsible for the well-being of others—and not just ourselves. We must seize Bobby’s words, nudge the social forces and mechanisms for positive change available to us, and transform the ideas he couched in his presidential campaign speeches into policy. I was fortunate to meet him once, during childhood in Chile during the 1960s when, as a progressive U.S. Senator, he visited the country that shaped me. Some twenty years later, I was graduating from Georgetown University’s School of Foreign Service when I befriended his children: Christopher, Rory and Maxwell. Hired as a Spanish tutor by the Kennedy household, I had the unique opportunity to become acquainted with them at their family home in Virginia, where I was able to spend some time in Bobby’s private study. Shrouded by a ghostly silence and largely undisturbed, the room where he once felt, thought and wrote in solitude was permeated with the lingering presence of an energy and aura that was his alone. Because I feel I was brushed by the residual echoes of the singular life force that was Bobby, a social visionary and honorary prince of peace-making in the wake of the Vietnam War whose thinking had been transformed by the assassination of his brother, I am compelled to honor him today. For me, the date not only commemorates the tragedy of his death, but also the epiphany of his youthful legacy and a brilliant future in public service cut short. His passing, however, symbolizes, in my view, the transfer of his torch on to us. At this moment in American political history when democracy is imperiled, we must not allow a seemingly inevitable and abysmal catastrophe to taint or invalidate the contributions and sacrifices of those who came before us and strove to make our country a model for the world. We must act boldly now, gather to hoist the creed of human rights and of individual sovereignty. We must protect our constitutional right to the freedom of expression in support of the common good. We should feel obligated to rescue those scattered to the winds in war-fueled diaspora, as well as those made stateless and set adrift as refugees fleeing persecution and violence. We also need to act decisively on behalf of ecological balance and sustainability, if we care anything at all about the survival of life on this planet. Bobby left us too early, but his luminous words continue to resonate. His voice still rings young and hopeful. In homage to his vitality and optimism, we must rise as private citizens and as a nation. Each one of us must take the pragmatic purpose of his words to heart and toil to fulfill the dream of a world at peace. We mustn’t squander precious time. We in the United States have the human capacity and the legal precedent to set our country on the right course and transform it into the compassionate global leader Bobby envisioned and the world expects from us.